Music as an alcoholic beverage. If you don't know who Thomas Bangalter is, maybe you've at least heard of his main project: Daft Punk. As half of the ever-popular French dance duo, alongside Guy-Manuel de Homem-Christo, he has conquered the world over with a string of club hits and unique albums. 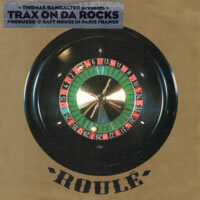 What you may not know is that, during the freshman days of Punkism, Thomas Bangalter was also cranking out music on his own using his self-maintained "Roulé" music label. He didn't release a large quantity of music, but his solo work is notable. His first EP, released way back in 1995, was "Trax On Da Rocks", a collection of five "trax" that tried to showcase what Bangalter could do. He missed the mark a little bit. The quintet of descants begins with On Da Rocks. With an introduction of light pub chatter (perhaps alluding to the "On Da Rocks" title), we get a funky soul-style bassline to pull up along on a smooth ride, along with a slightly higher yet equally smooth synth. Though there are a few filtering effects here and there, the very simple rhythm and melody stay pretty constant throughout the whole song. Next is Roulé Boulé is a bouncy affair with a squeaky two-second ditty repeated over and over acting as the hook. It is a simple song. Again, this song suffers from great repetition and some minute variations in an effort to keep it exciting. The song is under four minutes, though it could probably be even shorter. What To Do, what to do! A gritty overfilted bass thump outlines this musical journey, overlapped by a chopped male vocal that's trying to get out "I don't know what to do tonight" and some quick breakbeats. I'm not sure where Bangalter was going with this idea, but it barely flowers beyond what we get in the first thirty seconds. Eventually, we get a break where the full vocals get to make an appearance, but even then, there's very little else to tease the ears. Outrun tries to outrun the previous track, and it does, I suppose. The song relies heavily on one synth sample for almost six minutes while occasionally muffling or fading out the sound as a special effect. Eventually, Bangalter adds a squeak for innovation. This song actually sounds closer to early Daft Punk tracks than anything else on this EP. Last but not least is Ventura. Using a funky disco sample, this one is definitely the best dancefloor uplifter of them all. Halfway through, we get a break with some weird synth scratches to sever the potential monotony. Eventually, Bangalter mixes the two for interesting results. I'm not sure whether to love it or hate it. Although there are some danceable moments in this package for sure, it's just too bereft of ideas and some songs are far too repetitive for their own good. Each song could easily clock under three minutes, but they don't. Those familiar with the Daft Punk sound from the 1990s will like this, but most others will consider Trax On Da Rocks as more of an outdated demo of great things to come from this producer down the road.